Having the final say about your book cover design is one of the perks of self-publishing! And since your book cover is your final point-of-purchase marketing tool, you want it to stand out and entice your readers to Pick me! Pick me! from the bookshelves. With the success of your book at stake, you may be dreading the thought of attempting to create the perfect cover. Don’t worry! Self-Publishing Relief has some expert tips to guide you through the process. 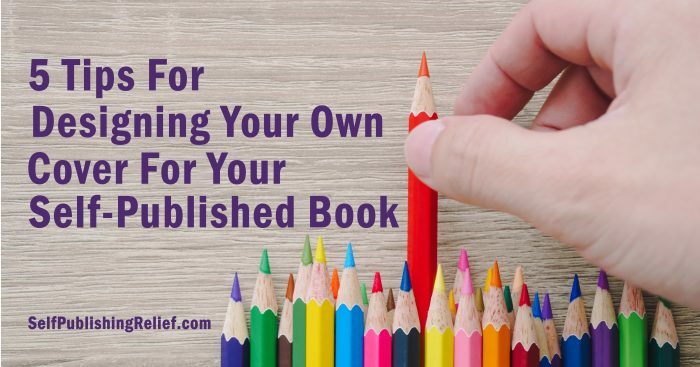 When choosing colors for your cover, keep in mind the tone of your book. Readers already have expectations about genre and atmosphere color schemes. Dramatic books typically have darker colors and a colder or brasher color scheme. Lighthearted stories usually have a warmer, more inviting palette. Determining whether you should use dark or light colors is an important decision that will lay the groundwork for your new book cover design. The artwork you select (or even the lack thereof) will have a big impact, so choose wisely. Again, consider what kind of story you’ve written. For an action-packed spy thriller, you might use images that have a ragged or destroyed edge. If your book is a romance, you’ll want to use images that are more serene to evoke the appropriate reaction in your potential reader. Great cover artwork can be just as memorable as the story you’re telling in your book and can effectively boost your sales. There’s an entire psychology behind typeface/font and the way potential readers might interpret them. For instance, sans serif fonts typically convey something bold and modern, while serif fonts might express reliability and elicit emotion. You might even see instances where people use multiple fonts on a single cover. This may convey complexity or eccentricities, depending on how they’re assembled. In brick-and-mortar bookstores, your print book’s spine will usually be the first thing readers see. Make sure the type is easy to read against the background. List your name and the book title, preferably in the same typeface as on the front cover. The spine color can emulate the color/image of the front cover, match the color of the back cover (if it’s different from the front), or even be a different, contrasting/complementing color. Once a potential buyer is tempted by the “sizzle” on the front cover, the “steak” on your print book’s back cover should seal the deal. Make sure the text on your back cover is legible and similar to the front thematically (colors, imagery, typefaces.) If you find that an image is overpowering your text and making it hard to read, choose a color from your front cover and use it as a solid color or gradient for the back cover. This will preserve the overall theme while also allowing the reader to focus on your intriguing book blurb, any book reviews, and bio information. QUESTION: When you’re looking through a bookstore, what type of covers stand out to you most: minimalistic designs or covers with beautiful artwork, intriguing fonts, or atypical design choices?